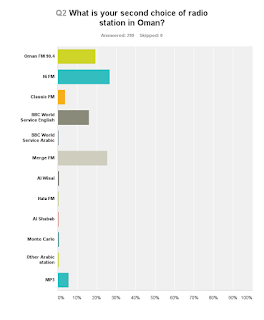 Home / Hi FM / Merge 104.8 / Poll / radio / Radio Wars: Your most popular choice of radio station in Oman. 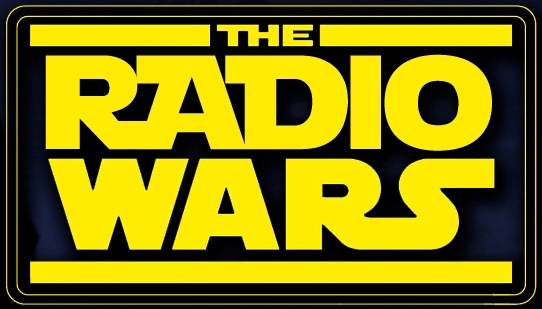 Radio Wars: Your most popular choice of radio station in Oman. So long term readers here on ze blog may recall I like to get extra nerdy every now and then and conduct surveys (and I am launching a new 60 second radio survey soon too). The results of the last radio survey that I conducted last October are in this post (I was surprised by the results, and then too busy to analyse them). 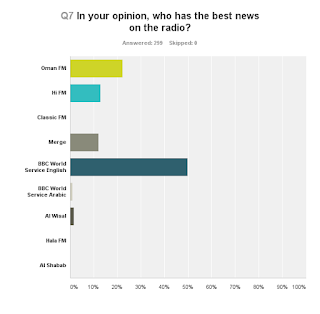 Oman 90.4 are what people in the ratings industry call "P1" (Programmed 1st, I think), Hi FM edged Merge by 1 single vote, they each have about 24.5% of the vote. 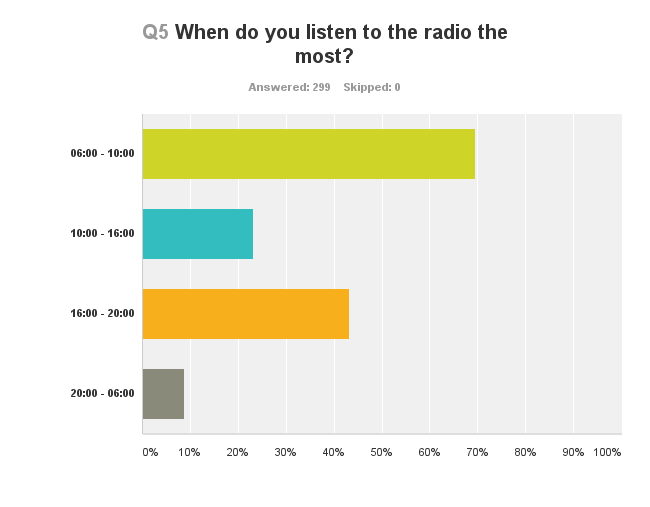 Interestingly, those that don't listen to the radio, and listen to MP3's, they have remained steady at about 5% of the vote (since the last time I shared results - 2015). This is always the same, but its a control question, and I'll come back to this one later as there is something a bit interesting to comment on here. To be honest, I almost exclusively listen to radio from Oman in the car. In my house, in the kitchen, my family streams radio from Toronto - we've found it a worthy use of an otherwise "retired" cell phone - hook it up to a blue tooth speaker and set TuneIn to whatever it is that you want. Morning and evening commute times will always be king in this question! Now this is obvious, also a control question, but also relevant to something I'll raise after all of these charts. Naturally, those Brits do seem to be dominating the airwaves for their chosen market... news. This one always amuses me, from facebook insights, I can see more women "like" Muscat Mutterings than men, but men always answer this nerdy poll more than women. 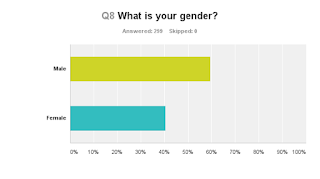 I wonder how I can get more women to conduct the poll? 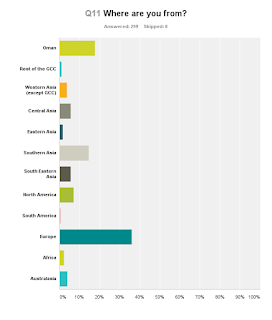 Probably no way, it is terminally boring, but I enjoy the statistics because I'm a secret nerd. 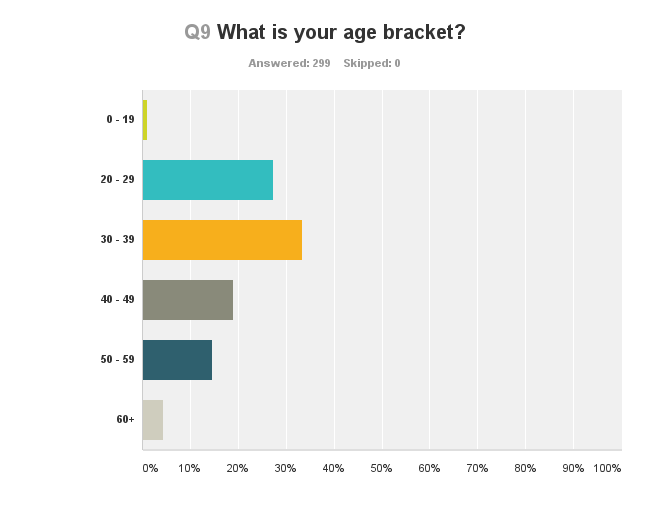 Clearly a steady post content about primarily where to get sauced has hit me hard in the under-18 age bracket. I'm not sorry about that! Now we start getting to the meaty stuff. Since the last time I shared these results (back in 2015) those of you that are earning RO 5,000 a month or more have doubled, those earning between 3 & 5K have also increased, and so on - you're all earning more - good for you! 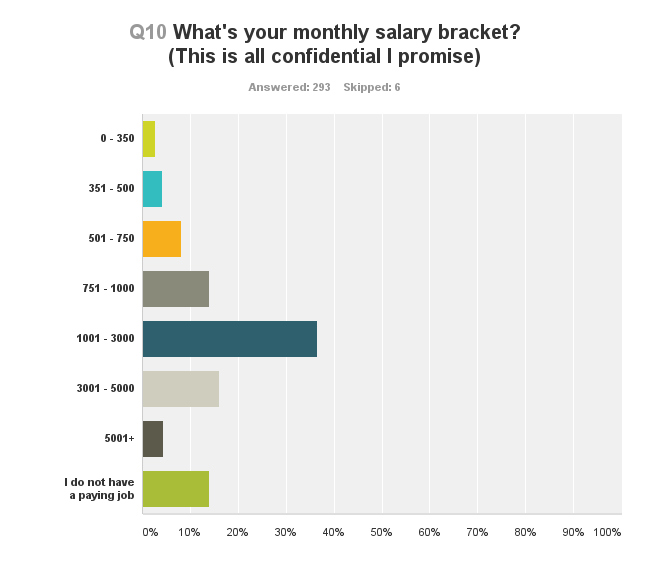 In fact, there were even more of you that don't have a paying job (I like to imagine the trailing spouse) that responded too. Excellent. Being a Brit, and interested about things that amuse me, I guess I've always appealed to other Brits, no big surprise here, however, I've been working on increasing those of you who are Omani, and this has doubled since the last time, which is good to see. 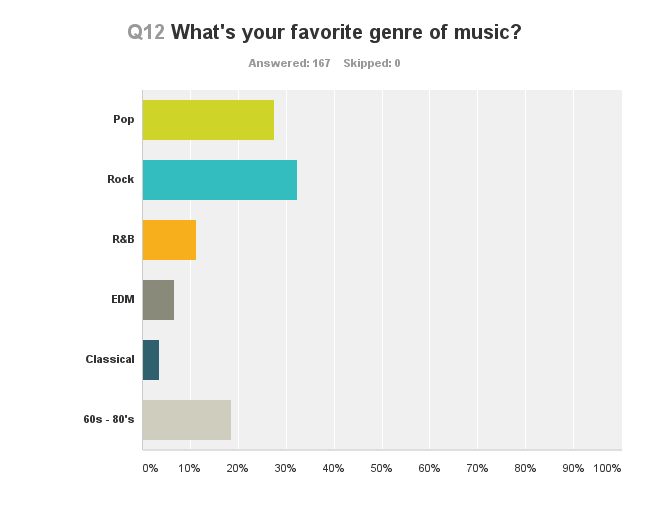 And now we get to the final question: What sort of music do you actually like the most? Pop.. well it's in the name isn't it... it's Popular. But here's the interesting bit, and this has been consistently voted on by respondents to this survey ever since the first time I did one way back in June 2011: So many of you like Rock music... and yet there is really no dedicated rock show on the airwaves here. Its also interesting to note that both 90.4 and Merge have diversified their music offerings away from pop music, and both, to my ears at least, are playing more rock music (and older music in general) than Hi FM, which has not managed to reclaim its top spot since Darren left last year. As you can see, Oman 90.4 has retained its place as the most listened to radio station amongst you - the people that responded to the radio poll. As always, the big caveat is that those of you that responded to this poll (and I hope read this blog from time to time) are not what I'd call a realistic cross-section of the population of Oman, more a cross section of the sort of people I generally interact with. Oman FM is dominant amongst the high-earners, Merge are the second choice, and Hi FM are not so popular. 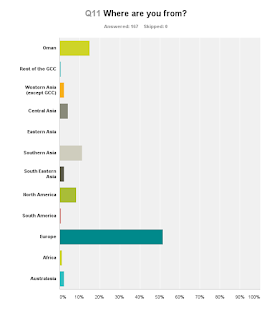 Mostly Europeans, but also, the vast majority of those respondents that stated that they were Omani too. And would you look at that?! 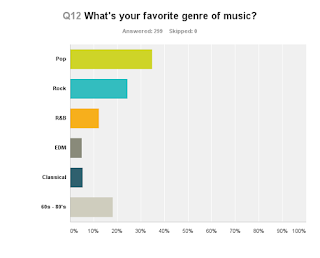 Those high-earners actually like rock music the most, and yet not a single dedicated rock show on offer on any of the music stations that I'm aware of. 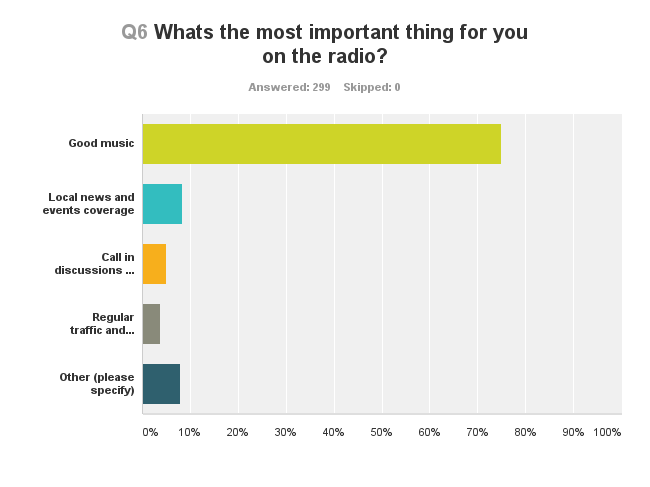 The logic seems worth a shot - play more rock music, win more affluent listeners. But at what cost? Like it or not, the elephant in the room is the fact that something like 60% of the nations population are under 25, and that is a chunky market to be chasing, which it appears, at least in the English language radio stakes, Hi FM are continuing to succeed in. 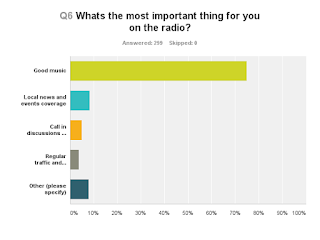 It's important to note that in response to Question 6, whats the most important thing to you on the radio is "good music". So how many listeners are switching because they want some rock music, and they're not getting it enough? No idea. However, the fact that Mercedes seem to be giving away a few motors on Hi FM does strike me as a bit of a misfire, given that those of you that earn more money per month appear to actually favour Hi FM the least. And its not really that hard to understand why - Hi are targeting the largest market in the country - the under 25's. I wonder how well Mercedes' campaign is going for them, targeting teenagers and people in their 20s.... I guess there are quite a few rich kids here! Well thats about it for this poll, I'll start another one very soon, and try and share the results a lot quicker than the last time. 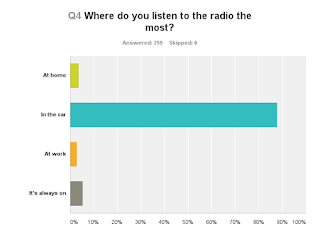 It is embarrasing what type of music we have to listen to if we rely on radio. Does anyone has any sense for music? Please, save us. 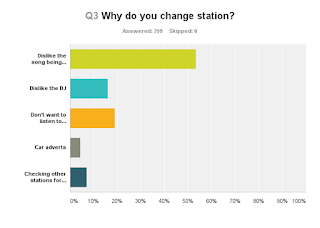 Yes, the music on the three popular music stations can at times be horrible, but it's the DJs that ruin the radio listening experience. 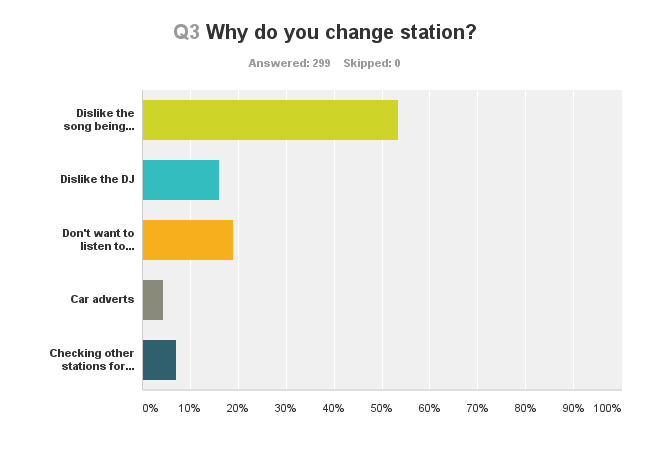 Whoever owns these stations should really consider going with a no DJ format and just playing music and advertisements.